An Ultralounge for eye wear! Fiercely independent for 30 years. We treat everyone like a rock star, and we treat rock stars like everyone else. Call us at (702) 254-0332 today. And we treat rock stars like everyone else. Within the bright city lights of Las Vegas shines a fiercely independent-owned optometry shop - Eyes & Optics in Downtown Summerlin. Created by optometrist, Edward Joseph Malik, he first established E&O in 1988. The goal at E&O is to provide the highest level of eyecare service and best selection of eyewear possible, where everyone's treated like royalty. From the moment you walk in, our entire staff will be focused on you. At E&O, we use the most advanced tech possible to insure your exam is relaxed, stress free, painless, and does not include probes, dilation, or eyedrops in most cases. We have the knowledge, experience, and products to assist you in creating the perfect look and the best vision, integrating fashion, lifestyle and high tech in ways no one can match. 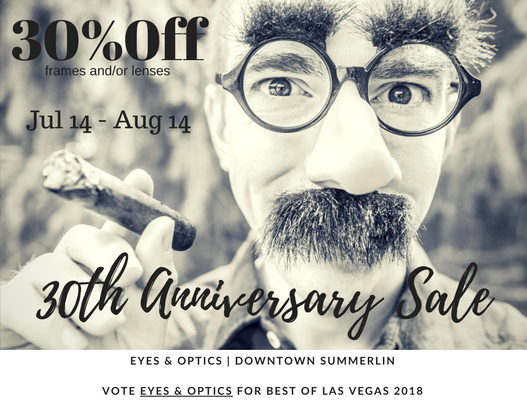 It’s that combination of old world service and trust, big city selection and style, and the knowledge to make it work that has allowed us to maintain a 5-star rating, and to be ranked Top 5 Independent practices in America by Invision Magazine, and voted Best Eyewear Shop and Best Eye Doctor by the readers of the Las Vegas Review Journal. We all thank you for that. When you’re ready, we’re already waiting for you. It’s all rock and roll! Come and see for yourself! history, fashion, music and art. Eyeglasses define character and alter perception. They are pop culture. atmosphere, featuring a fun collection of music and eyeglass memorabilia. "I had stopped in earlier last month and was told about the Maui Jim road show. Came back yesterday, and Valentino was dedicated to me the whole time I was there. Purchased a new pair of Maui Jim sun glasses, and I love them. They also have a pair of Maui Jim frames, that I like. Next year my insurance covers part of the frame, so I may be back for them. Thank you." "Great service, helpful staff and great experience as first timer..."